This salad came together in under 15 minutes and was the perfect way to satisfy my craving for something gloriously Greek. It’s part salad, part side dish and is sure to be a regular in my home, and hopefully yours too! Let me know if you get a chance to try it! 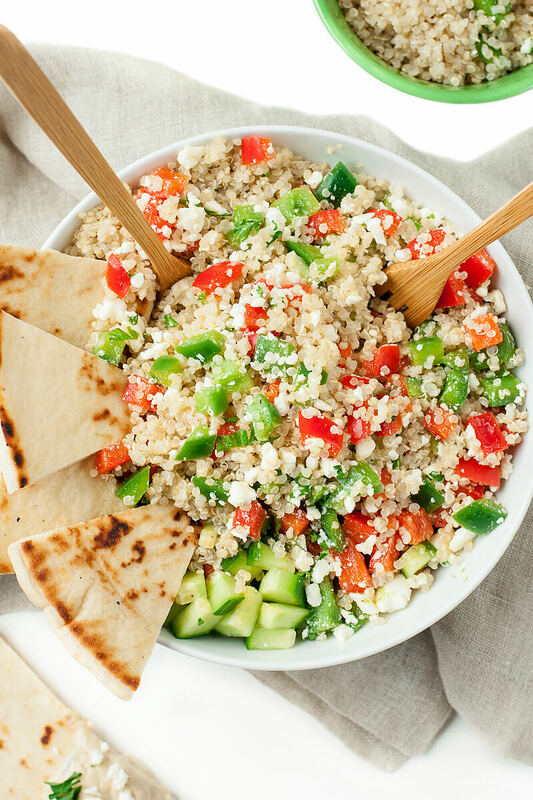 Ready to make these uber easy greek quinoa bowls? Fabulous! For the super simple vinaigrette, whisk together olive oil, apple cider vinegar, salt, and pepper. How easy was that!? Pour over your quinoa bowl and toss with a pair of forks or salad servers and dig. on. in. Add any additional salt and pepper to taste, if desired. For a speedy salad, do all your prepwork while your quinoa cooks. This way you'll only have one ridiculously step left after your quinoa is fluffy and ready to go. This salad can be made in advance to enjoy for weekday lunches or as a side dish for dinner. It's great room temperature and also wonderful chilled, so feel free to enjoy either way! As written, the recipe makes two entree-sized quinoa bowls or four sassy side dishes. Feel free to double the recipe if you're feeding a crowd! 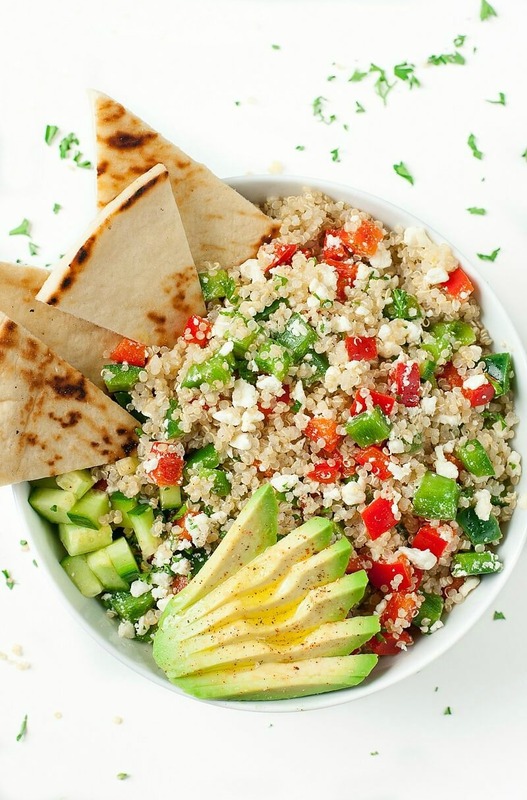 If you get a chance to try these healthy Greek quinoa bowls, let me know! You can leave me a comment here (LOVE checking those daily!) or tag @PEASandCRAYONS on Instagram so I can happy dance over your creations. I can’t wait to see what you whip up! Take your avocado game to the next level with a drizzle of EVOO and a sprinkling of salt, pepper, and paprika. It amplifies the melt-in-your-mouth deliciousness that is the all-powerful avocado. Feel free to add olives; just promise you’ll keep them away from me! When in season, toss in a few ripe + juicy cherry tomatoes too. You can use red or white wine vinegar in place of the ACV but ohmygooosh if you have a chance to pick up some apple cider vinegar (or already have it handy!) do it. It’s become a healthy and crucial part of my dressing game and I also love adding a shot of ACV to my kombucha tea for a little pre-breakfast detox action. Keep quinoa in regular rotation with a little meal prep magic! Cook up a large batch at the beginning of the week and refrigerate in an airtight container. Toss it into soups, chilis, salads, salads, and so much more for up to 4 days, then freeze the rest! Fast food FTW! Aiming to eat more salads and grain bowls? A little prep work can go a long way! Pick a day that works for you (some prefer the day they grocery shop + others like to stick to Sunday) and prep your veggies, grains, and greens. This can also be done for protein mix-ins too! I chop and dry my lettuce twice a week (I adore my salad spinner!) and cook a cup or two of quinoa. The quinoa will keep for 4-5 days and any extras can be frozen for a later date for use in soups, chilis, and baked goods. You can also chop your cucumbers, peppers, and all your favorite veggies (bonus points for broccoli!) and store in airtight containers in your fridge. Take things a step further by making this salad minus the oil, vinegar, and avocado and portioning it out into lunch-sized containers. When you’re ready to eat simply snag an avocado, dress the salad with oil and vinegar, and dig in! Try my super-popular Cranberry Walnut Quinoa Salad next! Yum!! I was out of ACV so I used some basalmic vinegar that I had on hand & also added some green onions I needed to use up! So good and plenty for lunches for the week. 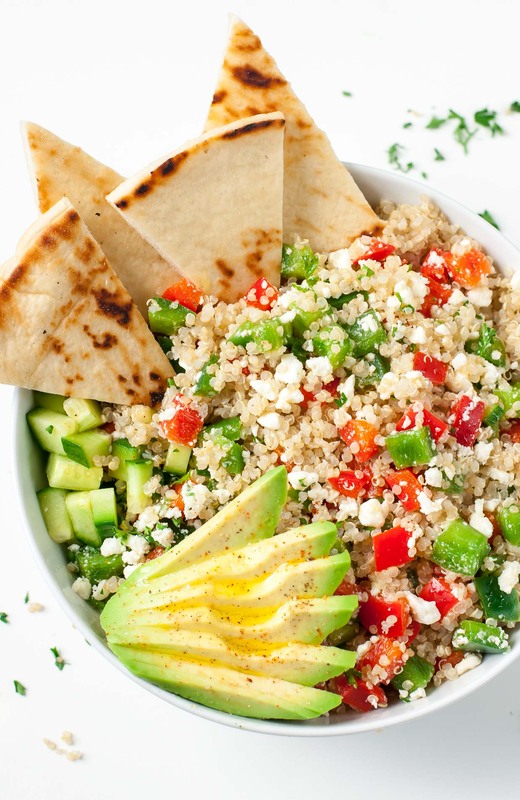 This is such a pretty and vibrant quinoa bowl! I’ll definitely be trying this recipe out soon! So gorgeous and tasty! I’m always looking for new healthy side dish with tons of flavor! I brought this to a party and it was gone in a blink! Thank you! What a gorgeous salad! And with my favorite ingredient – quinoa! It’s got so much color and would make the perfect light lunch. I like the idea of pairing it with pita and a little hummus too. By the way, I did make it yesterday and it was yummmmmy! So glad you’re loving the recipe Linda, thanks! the picture and comment section has avocado but not the written recipe. Is there a step for it or do I just use slices? Hey Susie! Slice and toss to your heart’s content! I make it differently each time simply depending on what veggies I have on hand so it’s super duper flexible based on availability! Hey thanks so much! My husband and I went vegetarian for Lent and this is one of our favorite recipes! We added chick peas to make it stretch a little farther and add some extra protein. Thank you Kaitlyn! 🙂 Yessssssss to the chickpeas! Perfection! Have you tried my Shawarma Chickpeas yet? They’re insanely awesome with this salad too! I’m seriously obsessed with this salad. I make 2 different groups of 3 salads to have each week and I make this one at least every second week or so. So glad you loved it Erin! Thanks! I am so impressed with your website. I found it on a Pinterest posting. Your recipes are easy to print and I’m eager to start trying them. They look absolutely delicious and healthy. ….and you have a great sense of humor. I think I’ll try this with chick-peas added! Maybe some cucumber slices on the side with yogurt… Yum! Hi! So I always have a hard time with what side dish to put beside this dish for supper, that isn’t meat. Any ideas? I looooove these with grilled veggie kebabs or as a side dish for vegetarian stuffed peppers! I can send some links your way if you’d like? I love the sound of this recipe. I have never cooked with quinoa, and I’m excited to give it a go. Thank you Nancie! I hope you *adore* it! Quinoa is such a fun grain to cook, I just love it! Oh goodenss! I found this pin tonight and it looks so yummy. Then reading it I see you wrote about Pensacola. We lived there from 2010 until 2013. Now I live back in central California. I loved going to Jordan Valley by the mall. This looks absolutely delicious! I can’t wait to try it ASAP! Wishing I was having this for dinner tonight! Looks amazing! Such a beautiful bowl of goodness! I have made the sad mistake of not rinsing, moving to fast, and got so incredibly sick. Now when I try to eat quinoa my body recognizes the protein and I get sick all over again.So now I have to use couscous in place of quinoa. Poor baby; I didn’t know that was possible! Luckily couscous is super delicious too! I think we’ve all been there 😉 There’s a natural defense mechanism in the form of a bitter coating on the quinoa. A simple rinse removes it and makes the quinoa taste so much better! I love this kind of meal. I totally know what you mean about being inspired by restaurant meals. Hummus sounds amazing! Hey, I’ll definitely need to try this! With IBS, I try to avoid onion and garlic. 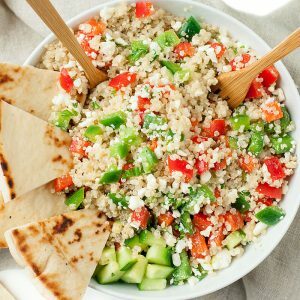 And I’ve tried Greek quinoa bowls with chicken, but I like the idea of cutting down on meat, for environmental reasons. Love your recipes–they always turn out super-flavorful! Yes, you can. I actually make my garlic-infused oil on an as-needed basis. The low-FODMAP diet has saved my life–that’s actually what I blog about! Hope it helps you too.